This seminar and trade show offers excellent opportunities to learn more about modern living architecture and meet industry experts in the St. Louis area. Living Architecture 101 will help engineers, architects, landscapers, planners, etc. understand the design and application of living retaining walls, interior/exterior living walls, pre-grown living fences, and green roofs. An in-house trade show will feature local vendors associated with living architecture and green building in the St. Louis area. Coffee and networking begin at 7:30am. Presentations begin at 8:30 am. Meet the local chapter of the U.S. Green Building Council! Connect with students from all over St. Louis! Find out more about careers in sustainability! 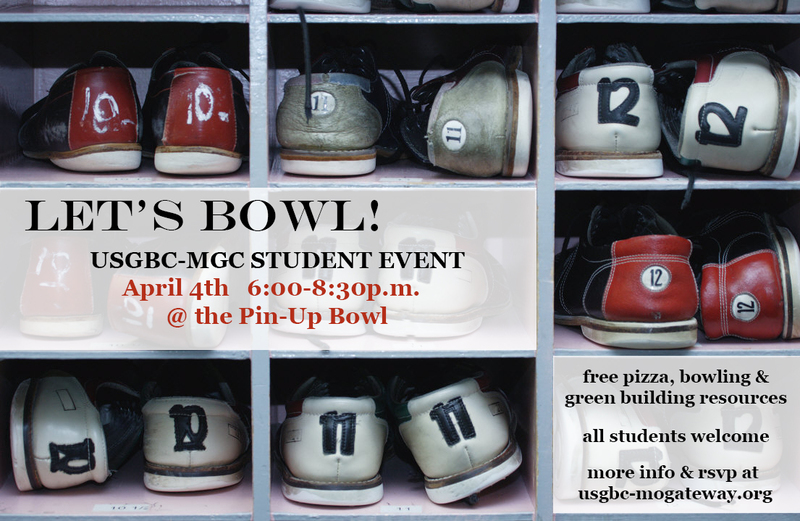 Eat, bowl, and have fun! Many thanks to Joe Edwards, Pi Pizza, and the Pin-Up Bowl! The 2013 National Climate Assessment draft has been released for public review until April 12, 2013 at ncadac.globalchange.gov. This report, produced by more than 240 authors representing federal agencies, academic institutions, private industry and non-profit organizations, concludes that climate change, once considered an issue in the distant future, has moved firmly into the present. This panel will explain the science behind the report, some implications for our region and what is being done at the national and international level to address this issue. 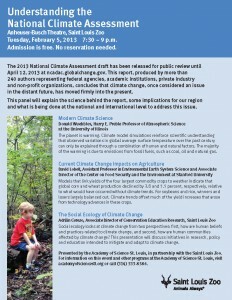 Tuesday, February 5, 2013 7:30 – 9 p.m. Admission is free. No reservation needed. Click here for more details about the program and panelists. The St. Louis High Performance Building Initiative (HPBI) is regional project organized by the St. Louis Regional Chamber and Growth Association (RCGA) and the U.S. Green Building Council – Missouri Gateway Chapter (USGBC-MGC), and supported by 19 additional stakeholders, to increase the square footage of third-party verified green space in the St. Louis region. For more information about the HPBI, visit http://stlhighperformbldg.org/. 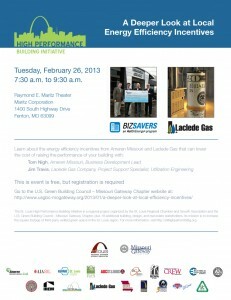 Contact USGBC-Missouri Gateway staff by email, usgbc-mogateway@mobot.org, or phone (314) 577-0225. Join Modern STL on Saturday, February 2nd for Authenticity + Sustainability: Making the Most of Your Mid-Century Modern Masterpiece. Local design and preservation professionals will present on how to retrofit your mid-20th century home to 21st century sustainability standards, and how to utilize available preservation programs to benefit from tax credits and designate your home as historic. COST: $10 for Modern STL members, $15 for non-members. Lunch included. Please RSVP to Nathan Wilber at wwilber2003@yahoo.com by January 31st – seating is limited! Greening the Heartland will celebrate its 10-Year Anniversary in Chicago in 2013. The U.S. Green Building Council’s Midwest regional conference, Greening the Heartland 2013 will present four days of education and networking opportunities in cooperation with BUILDINGChicago on September 9 – 12. The conference Advisory Committee is now accepting proposals for presenters and topics. All proposals must be submitted online by February 8, 2013. Learn more here. This year’s conference aims to encourage robust discussion of how the Heartland’s building industry is evolving to embed resilience into its solutions for the built environment as focused in the topic following topic areas: Health & Environmental Quality, High Performance Buildings & Building Science, Design for Resilience, Green Technologies & Materials, Natural Capitalism, Sustainable Community & Campus, Process, and more. Visit the conference website at www.greeningtheheartland.org. New Category Added to EBie Awards! The EBie Awards are a nationwide juried competition created by the Urban Green Council, USGBC New York . The awards celebrate people working in Existing Buildings, recognizing “unsung heroes” who have made great strides in improving environmental performance but whose accomplishments may otherwise go unheralded – not just building owners, but building operators, auditors, commissioning agents, lighting designers, plumbing engineers, and others. Unlike other awards, the EBies are based on measurable improvements in performance. Deadline for submitting nominations is February 26, 2013. Learn more at www.EBies.org. The USGBC-MGC Green Shadow mentor program was highlighted in the Wed, January 16, 2013 edition of The Beacon. Chapter member mentors, Wanda Evans and Richard Reilly, were interviewed, as well as member and Shadow Caeden Sweet and staff member Hope Gribble. The article provides a nice overview of the program, including insight from participants’ experiences. Click here to access the full article. USGBC-Missouri Gateway’s two full-day (16 hours total) LEED Green Associate Exam Prep course is designed to prepare participants for the LEED Green Associate exam. Skilled instructors will provide an introduction to LEED, discuss methods of sustainable project delivery and green building principals, and offer test taking tips. Both of which may be purchased on the USGBC Store page of the USGBC website. 3) LEED Green Associate Candidate Handbook (free download) and references outlined on pages 10 & 11 of the handbook. Students must read and understand the steps needed to enroll for and take the exam. The instructors will only address this as a broad overview. Students will receive a certificate of completion at the conclusion of the course. This course does not guarantee students will pass the LEED Green Associate exam. Additional time outside of class will be required for reading the required textbooks. Registering and taking the LEED Green Associate exam, and any associated costs, are not included in this course. What if you could streamline the certification and documentation process, cut back on incremental LEED costs, and find clarity and a definitive path when working on a multiple building project? The On-Campus and Multiple Building Certification Program is a LEED certification program designed to help project teams easily and efficiently certify multiple projects located on one site, under the control of one entity. This program fits any organization certifying a number of projects on the same site or whose project scope includes part or all of an entire campus. Campus Guidance provides a holistic, sustainable approach to project management and addresses the unique challenges and opportunities inherent in campus projects. Project teams can document a credit once for the entire campus through shared credits to capture economies of scale in the certification process. Implement Campus Guidance for your multiple building LEED projects and streamline your certification and documentation process saving time and money. Join us to learn if Campus Guidance is right for your project. Click here to register for this single session. Click here to purchase a 2013 Unlimited Lunch ‘n LEED Pass.